In building Amethyst, transitioning the build from a green themed system called Absinthe, there were two places I used 16mm OD PETG tubing. First was in front of the pump housing, and the second was in the U-turn from the graphics card to the CPU. One thing about Absinthe and Amethyst that stand out are the PrimoChill Revolver fittings. Specifically how tall they are. They really stand out. And even the EK fittings I used for the 16mm tubing are quite tall, leaving not much visible for the U-turn. The dye has also been fading. As in I need to keep adding dye or the purple color eventually drops out of the coolant and it becomes a somewhat UV-reactive clear. In doing some reading, the PETG tubing is the likely issue. So the solution is to switch to acrylic. 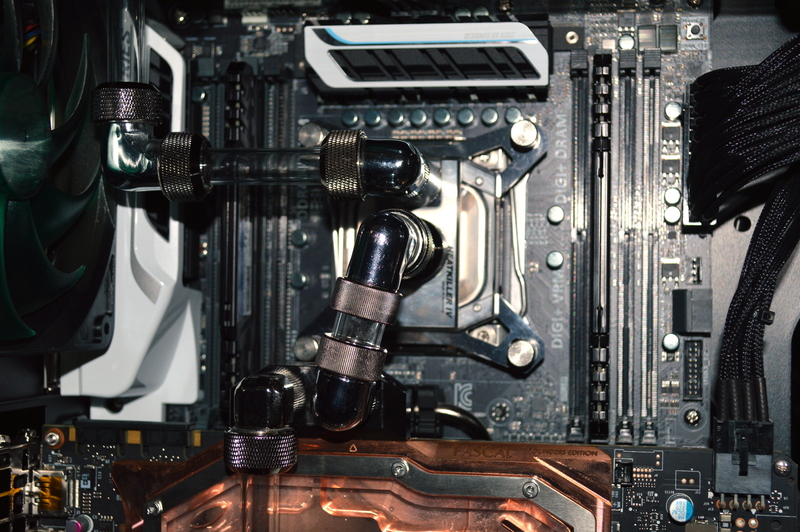 But given the price of acrylic tubing branded by one of the big-name water cooling companies, I decided to try local. Would it be more cost-effective buying from a plastics producer or distributor and cutting out the retailers? In the Kansas City metro is Regal Plastic. I initially tried e-mailing them for a quote on their 5/8″ OD tubing, but there were some missteps in that communication. So I just called in instead and was able to arrange delivery. Now I didn’t entirely “cut out the middleman”, since Regal is not actually a manufacturer. Instead they source the plastic and distribute it. And it was more expensive than similar tubing through Performance-PCs. They charged me about 2.19 USD/ft for 8ft of tubing, plus a 7.50 USD processing fee and 11.75 USD for freight (probably would’ve been cheaper having them send it to me). Regal actually gave me shy of 10ft of tubing – they looked like leftovers they bought back from someone – so it worked out a little better, about 1.75 USD/ft. What they gave me was also not in the least what I expected. The tubing just really needed to be cleaned and polished, so I decided against using it for Amethyst and set it aside. I may still use it, but likely not for this project. Naming a build “Amethyst” implies a deep amethyst purple. Siberian amethyst. So finding the right color is a major limitation. I thought I’d found it with the purple dye, but not quite. So instead of purple coolant, I decided to go with something a little flashier. Only one problem… and it’s the same problem with lighting: finding the right color. Spaz Stix has a color (both aerosol and air) called Amethyst Purple Pearl. Other “candy purple” paints I’ve seen also appear to be close to what I’ve been wanting. There are numerous ways to look at this. I learned about the Rust-Oleum lineup of Universal spray paints. At first I didn’t think purple was an option here, until I visited Michael’s website. More on that in a moment. There is also a pearl clear coat. Half the problem is, again, finding the right shade of purple. Here’s the list of what I tested. All of this was tested on an aluminum panel. Didn’t pay attention to surface preparation, which wouldn’t make a significant difference in the color test. This was probably as good as it was going to get with the Spaz Stix paint. I had a second panel painted with the Black Stainless Steel as the base coat, and the effect wasn’t much less pronounced. But this isn’t amethyst. This is a sparkly purple. Okay technically it can be amethyst, but this isn’t the color my wife and I are looking for. Now had I dug a little more through Rust-Oleum’s lineup, I would’ve discovered their Gloss Purple paint and saved myself from buying the Spaz Stix. Home Depot carries the 2x Gloss Purple while Michael’s carries the Universal Gloss Purple. The latter isn’t listed on Rust-Oleum’s website, oddly enough. The former is also a little less expensive, about 4 USD. The Universal lineup will cost about 6 USD at Home Depot, 9 USD at Michael’s. But Michael’s also carries the Frosted Pearl Topcoat, whereas Home Depot carries it online only. I did two color tests on this: one with a gloss black base coat, and one without. 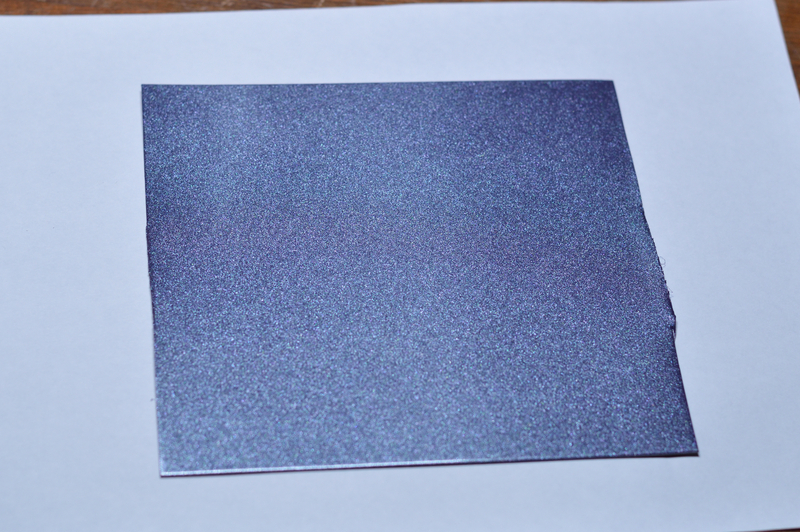 Both tests were, again, on an aluminum sheet. Wasn’t all that concerned about surface prep here. This isn’t nearly the color I’m going for. It certainly is a deeper purple than the Spaz Stix “amethyst”, much closer to the indigo shade I’m looking for, but not quite there. Adding a black base coat didn’t affect the outcome. Either way, this is as close as I can get going with off-the-shelf spray paint. At least without going custom mixed paint and using something like the Preval system to apply it or, God forbid, brushing it on manually. There was one “last resort” option I discovered. I call it “last resort” as it’s $50 for a 12oz can: Alsa Candy Purple “Killer Can”. But that is the color I want. At $50 a can, with the potential of multiple cans being required, I’m not willing to spend that much unless it’s, as described, my last resort. I did discover a less expensive option. 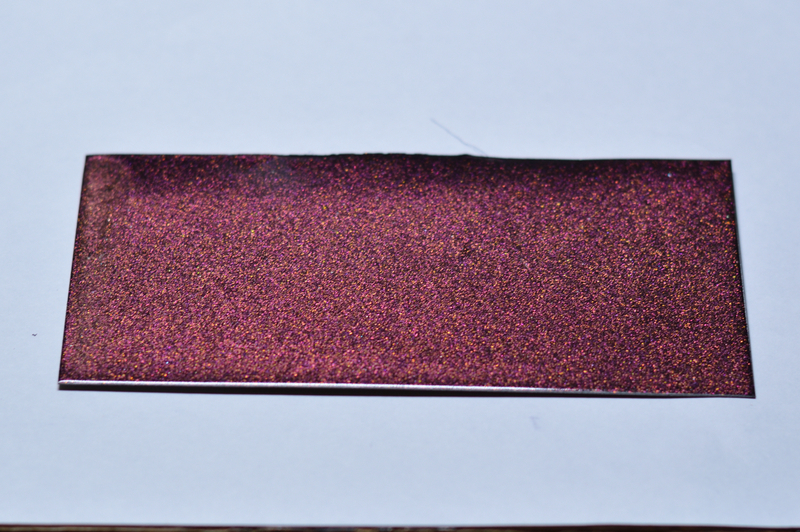 Deep Amethyst Pearl spray paint from Mopar, part no. 04886266AA. Mopar is the parts company behind Fiat Chrysler Automobiles (FCA). That part number is not listed on the official Mopar website, meaning it’s likely not available through one of the local dealers. And at about 29 USD for a 12oz can for just the paint, it was a better value. And they sell complete kits with primer and clear coat if you don’t want to go with something off the shelf. This isn’t the end of the color tests as I haven’t yet settled on the final color. I really like how the candy purple looks from Alsa, but I don’t want to spend 50 USD on one can of paint. Unfortunately smaller options don’t appear available. I could contact them for a color sample, so we’ll see. But I’m currently leaning toward the Deep Amethyst Purple from prior Chrylser vehicles. Rather than order a can through ScratchWizard, I’ve ordered a can of the Mopar-brand Deep Amethyst Pearl paint from the supplier linked above. I’ll post the next color test along with the plan of action. Now I live in an apartment, meaning time in the year is running out for actually doing the paint spray. My other problem, living in an apartment, is setting up for spraying the case. This will require a booth, or something similar, so I’m looking at both DIY and off-the-shelf options. Push comes to shove, I’ll get quotes around town to see if any of the body shops can help me out. In fact, I may just do that in the end, after settling on the specific color. I do also intend to go with the wider tubing. But with the change to spray painting the chassis, I’m actually considering going with custom sprayed tubing to match.